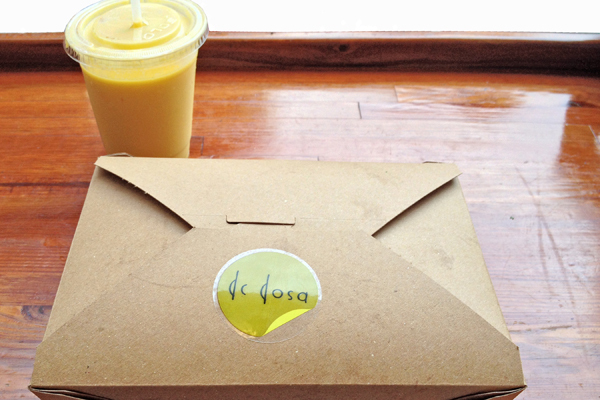 DC Dosa Gluten-Free in Washington, D.C.
Update: We are excited to share that as of September 2014, DC Dosa has moved to the vibrant Union Market in DC’s Noma neighborhood! Tucked neatly inside the Whole Foods Market in Washington DC’s Foggy Bottom neighborhood is a true hidden gem. Taking Whole Foods’ healthy on-the-go cuisine to a whole new level, this particular location features a variety of food stands operated by local entrepreneurs. Enter Whole Foods at street level, bypass the bakery and coffee bar, and zero in on DC Dosa. 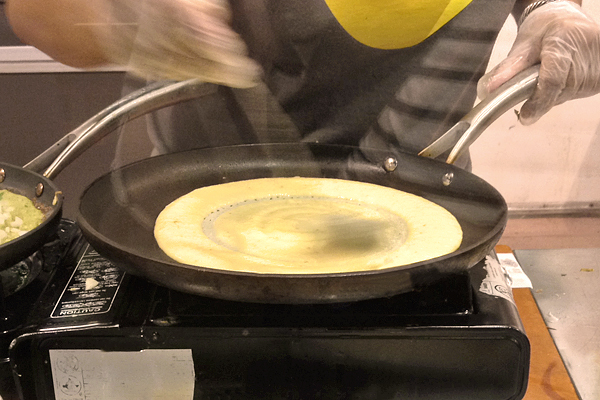 You’ll know you’ve found it when you see owner Priya Ammu creating beautiful, mouthwatering dosas at lightning speed. At DC Dosa, the focus is of course on the dosas, which are all naturally gluten-free and vegetarian. This main dish is based on a family recipe, handed down by Priya’s mother-in-law and perfected by the owner herself. Three kinds of these South Indian lentil and rice crêpes are mixed with a blend of spices and prepared fresh daily: mung lentil, yellow lentil, and four lentil. To fill your dosa, choose from curried potatoes, eggplant & sweet potatoes, or carrots & cabbage. To top your dosa, pick from three flavorful chutneys: cilantro sesame, onion tamarind, or tomato peanut. Though it’s tough to choose among the various combinations, rest assured that all of these dosas are delicious. For a lighter and more subtle flavor, the yellow lentil is just right, or for a heartier dosa, opt for the mung lentil (pictured). For the fillings, the cabbage & carrots are a nice, light option, while the eggplant & sweet potatoes and the curried potatoes both boast a deep, flavorful spiciness. Each chutney offers a rich, cooling tone, the perfect way to top off your dosa. To finish off this meal in style, don’t miss the legendary lassis. Made with seasonal fruits, yogurt, honey, buttermilk, and spices, this is a decadent yet refreshing drink. 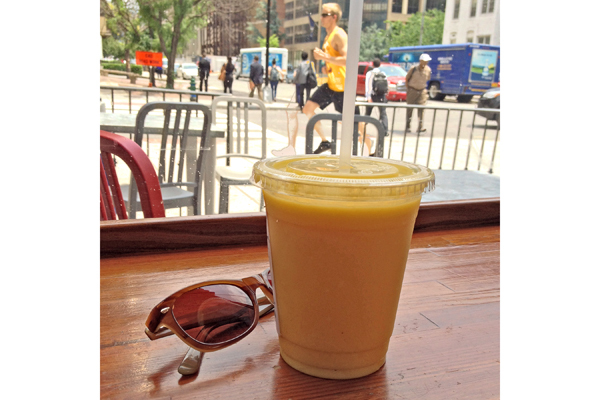 Summertime visitors, stop by for a delicious mango lassi while you can! 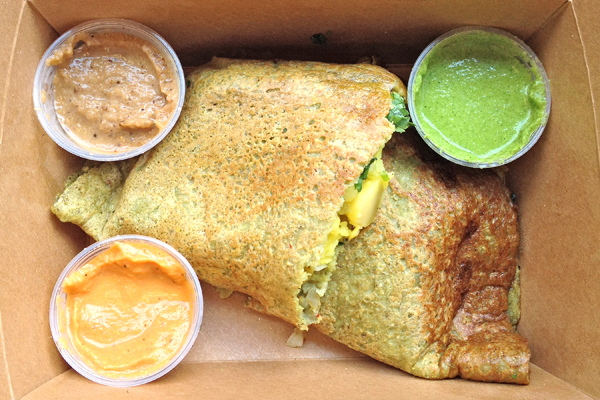 Note: DC Dosa prepares all of its batters, fillings, and chutneys fresh each day. No gluten-containing ingredients are used, and appropriate caution is taken to prevent cross-contamination. Because the larger Whole Foods facility is shared with other food preparers, however, DC Dosa’s menu lists all items as “wheat-free.” Don’t hesitate to contact DC Dosa for additional information or clarification. Disclosure: DC Dosa kindly provided me with a complimentary beverage. All opinions expressed are my own. Where? 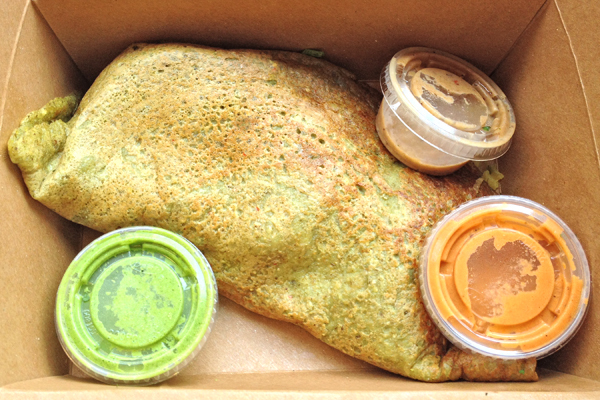 DC Dosa is located inside Union Market in Northeast DC: 1309 5th Street NE, Washington, DC. « JRINK Juicery: Washington, D.C. I love dosas! When I come to DC, I will definitely check this place out. Your pictures are making me hungry. Thanks Erin! This is my favorite new lunch spot. Make sure to go when you’re hungry—the dosas are huge. Let me know when you’ll be in town and let’s set up a GF get together!